Don’t feel that you need to bring absolutely everything with you in the car when you come to Anglesey. Everything you need for your visit you can buy in Benllech. Not only do we have a Co-op, Spar and Tesco Extra in the village but further afield there is a Waitrose in Menai Bridge. In Llangefni in the centre of the Isle of Anglesey there is an Asda and Iceland. At the Holyhead end of the A55 Expressway you'll find a 24 Hour Tesco and Morrisons supermarkets. 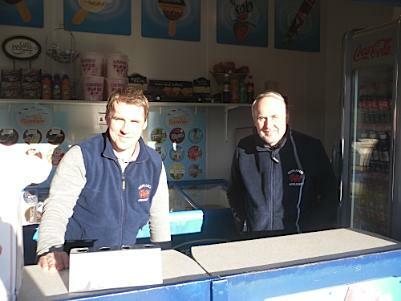 You'll find a couple of butchers in the village as well, a post office and a shop in the square that will sell you buckets, spades and snorkels. Tesco Extra - You may remember the Lewis garage in the village square. That's gone and now you'll find this decent sized supermarket. Co-op - Along the main street to the south. Spar - In the small shopping precinct more or less opposite the Co-op. in this little precinct you'll find a little laundrette here, a Spar store, a Kebab shop - the little cafe 'Caffi Bach' (Little Cafe) has sadly gone. Hairdresser - Steil (Style) Opposite the arcade. Family Butcher - On the main street selling popular spit-roast chickens. There's another family butcher on the opposite side of the road and further along from the Breeze Hill Hotel (excellent food). The small village shops survive because many of its inhabitants have retired here and support their local businesses. 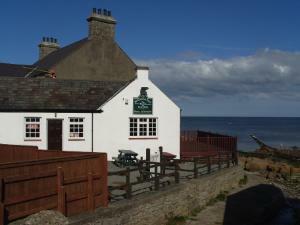 Readers are frequently asking questions about where on Anglesey have dog friendly pubs and eateries. Please let us all know if you come across any good ones. Or bad ones for that. Use the 'Share a Thought' form at the bottom of this page if you are so inclined. 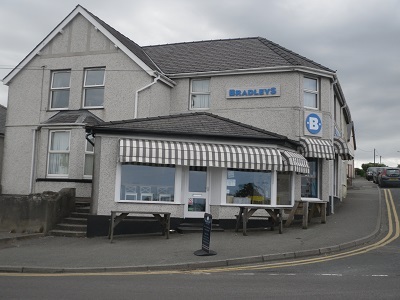 Bradley's Deli Coffee Shop - Absolutely excellent coffee and delights both sweet and savoury. 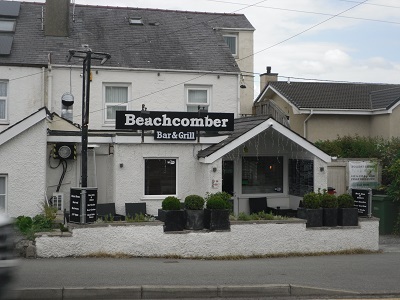 Beachcomber Bar and Grill - Opposite the small shopping precinct. The menu here is spectacular! 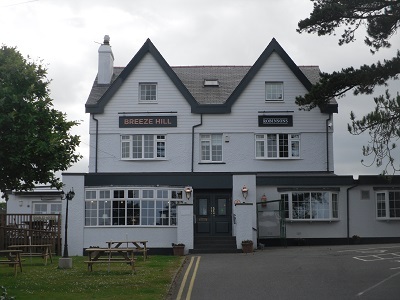 Breeze Hill - A bit farther beyond the main street up on your left as you travel southwards towards Pentraeth. A family menu with y busy social calendar of activities: quiz nights, charity events. 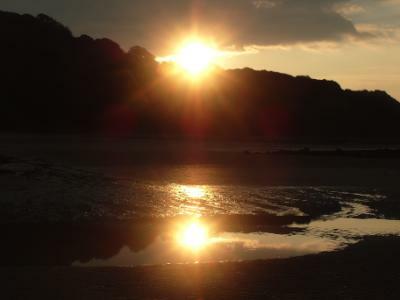 For me this has always been the fulcrum around which Benllech local social life revolved. Talent House - This used to be a very good Cantonese restaurant on the main street, but is now a takeaway. Can someone send in a report please? The Benllech Hotel - In the square. Family menu. During the holiday period it is always incredibly busy. The Crab Shop - In the square opposite the Tesco. I'm not a fan of crab, but I am a fan of everything else sold there. Kebab Shop - In the little shopping precinct near the Spar. 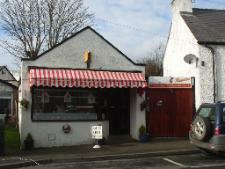 Two great Chip Shops on either side of the village square. 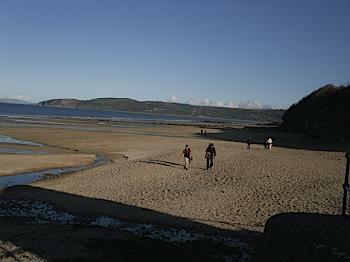 BENLLECH ISAF - Guest House and The Bay Cafe. Licensed. Directly overlooks the beach. Telephone (01248) 852700. It's on your left at the bottom of the hill from the garage. The WENDON - Teas and snacks right on the beach. 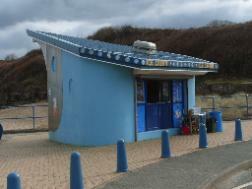 The (Dan Dare) Ice-Cream Kiosk- Above the beach and Absolutely Fabulous! ice creams. Trust me on this, because I am a regular consumer of these heavenly gifts form Dan Dare. 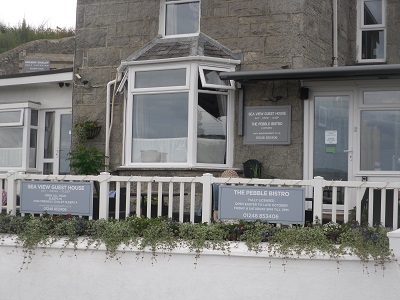 The Pebble Bistro is brilliantly well-placed for a lovely evening's socialising and eating. (01248 853406). 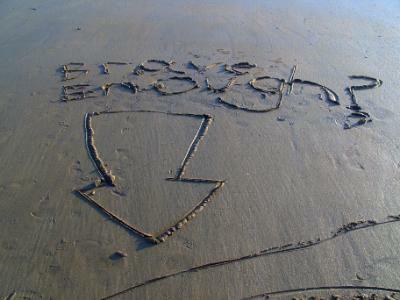 It also leads a double life as the Seaview Guesthouse. For lazy people with good taste it sounds perfect. Share YOUR favourite with everyone by Clicking Here! Like most of Anglesey - other than Llangefni - Benllech is bank-less. 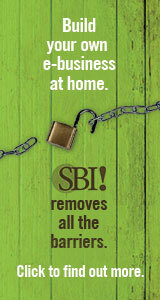 You can also ask for Cash-Back at the Co-op, Spar and Tesco Extra. Post Office - in the Tesco Extra in the village square. Remember that you can always draw money across the counter in any post office if your bank has an arrangement with Post Offices Ltd. Rural post office survive or die because of your custom, so please buy something while you're there. Rowlands Pharmacy - Along the main street. In Brynteg - If you head up the hill past Tesco and drive all the way until you come to the junction at the California Inn, turn right here and there is a very small garage a few hundred yards ahead on your right. This road past the garage will take you to Marian-Glas, which brings you to the coast road junction and opposite you is the road down to Traeth Bychan Beach. In the car park in the village square. In the beach car park. Please be aware that County Council toilets are not left open all-year round. 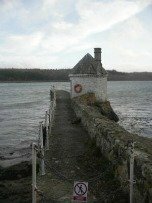 In fact, talking about Traeth Bychan, the toilet there is for sale. Tenders in a soiled... sorry sealed envelope. Please be aware that Anglesey County Council is looking to sell-off or close all public toilets. Daft Buffers! There is a scheme that nobody seems to know about where Anglesey County Council pay around £500 to pubs, cafes, hotels and public buildings in some towns to allow people to use their toilets without being obliged to buy anything. A list exists! 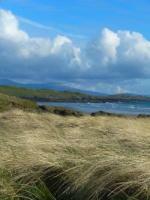 Check this link below for Anglesey County Council updates. Anglesey Public Toilets Update.